If you’re reading this blog, chances are you already have a library card. If not, now’s your chance: September is Library Card Sign-Up Month. 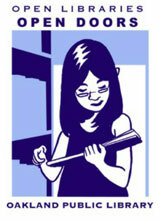 Find out more about Oakland Public Library cards and download an application on the OPL website. Already have your card and ready to celebrate? Check out the American Library Association’s list of 60 Ways to Use Your Library Card, send in a photo of yourself with your library card to enter the ALA’s “My Library Card is Valuable Because…” contest, or just head on down to the library and check out some books!